In search of better grazing lands, William Duggan Tarlington (W.D.) and three Aboriginal men travelled south of Braidwood and over the ranges to Cobargo, arriving in February 1829. W.D. 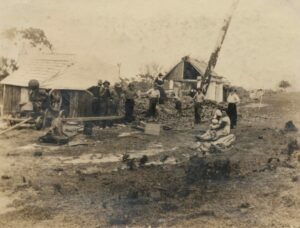 set up camp beside the creek where the showground is today. Noise from their party alerted some Kooris camped further downstream who were astonished at the sight of a white man. The Aborigines travelling with Tarlington understood the Cobargo mob’s language, and friendly relations were soon established. Tarlington returned in 1832 with stockmen and cattle and took up land along the riverbanks. Other squatters from the Braidwood district were quick to follow and the area at this time was known as ‘The Junction’. In 1840, under the Primitive Right licence system, Peter Imlay acquired substantial land holdings in the area, naming his property “Cobargo”. When the Robertson Land act was passed in 1860, many free selectors established themselves in the district, which resulted in rapid clearing of the land for more intensive agriculture. The names of these first families were Salway, Clugston, Cullen, Motbey, Wilson, Allen, Gillespie and Nelson. The abundant black wattle in the Cobargo district created a thriving industry. Leather was essential to the developing NSW colony and the bark was harvested and shipped to the tanneries in Sydney where it was used in the tanning process. Receiving £4 per ton, many farmers paid for their land from the wattle bark they harvested on their property. The employment opportunities at the bark mills and transport to the ships also provided income to the settlers. During this time the village was called ‘Wattleton‘. The township of Cobargo began to take shape in the early 1870s, the school opened in 1871 and that year the village had a post and telegraph office, a store, hotel, church and blacksmith’s. Development gained pace after Mr Walker, Commercial Bank Manager in Bega, purchased 30 acres from John Gillespie and subdivided it into town allotments, fronting both sides of Bermagui Road and the southern side of Moruya Road. 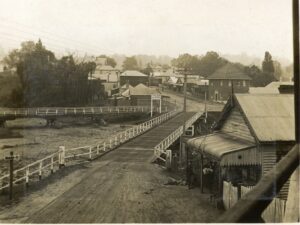 The construction of a bridge over Narira Creek in 1882 and improvement of the coast road to Bermagui further increased the development of the area, with a regular flow of produce and supplies to and from the village to the markets in Sydney. On the 30 May 1885 a meeting was held to form the first Agriculture Society. It took much “spade work” to convert the heavily timbered and uneven land into a showground. Four years later the first Cobargo show was held and every year since the show has been a major event in the district. It is believed the dairy industry commenced at W.D.’s property Bredbatoura in the 1870s where the butter was packed in wooden casks and sent to Sydney on the sailing vessels. In 1901 the Cobargo Co-operative Creamery Butter Company was established and the factory opened the following year. 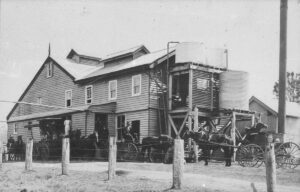 The butter was packed under 3 different brands, Emu, Cobargo and Narira, freighted to Bermagui by a six-horse team and loaded onto the steamships to Sydney before being exported to England. The factory continued operating until 1980. Pig production provided another income for the dairy farmers as the pigs could be fattened on the skimmed milk. Cobargo today is a vibrant village rich in history and creative arts. The turn of the century buildings and shopfronts offer a diverse shopping experience with a locally made, locally grown culture. The annual Cobargo Folk Festival showcases the collective spirit of the community.